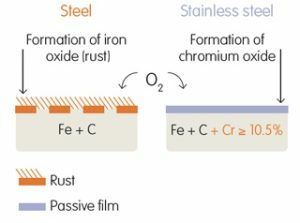 Passivation is a non-electrolytic process to removes free iron from the surface and forms an inert, protective oxide layer that in turn renders the stainless steel more rust-resistance due to lack of iron to react with the atmosphere by using nitric or citric acid. We already discussed about What is Passivation and What are major Guidelines? 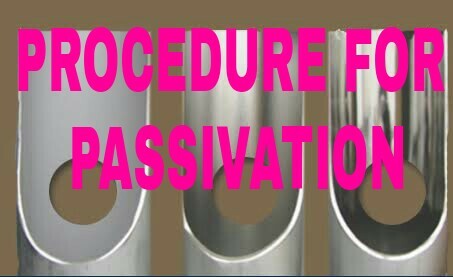 Here discuss procedure of Passivation. All welding flux and weld spatter to be removed by initial cleaning. Take 25-50% by volume of water in the storage tank (Water quality- chlorine content should be less than 5 ppm), then circulate the water for 30 minutes. 99% water with not more than 1 ppm chloride. 1.5 times the hold up volume of the distribution piping and 1.5 times the volume of the equipment in the loop (except tanks) or 25% volume of the storage tanks whichever is higher. Drain the acid solution in the storage tank by opening the drain valve and system by opening the lowest point valves. Flush the system with water (of the water quality- chlorine content less than 1 ppm) till the whole acid solution is flushed out. NOTE:- If Nitric acid concentration is to maintain 3%, solutions have to hold in the equipment or calculate for the following minimum period at temperature indicated. If Nitric acid concentration is to maintain 5%, solutions have to hold in the equipment or calculate for the following minimum period at the temperatures indicated. If nitric acid concentration is to maintain 10 % solutions have to hold in the equipment or calculate for the following minimum period at the temperatures indicated. Drain the water in the storage tank by opening the drain valve and system by the lowest point valves. Repeat the above procedure till we observe the conductivity 1.5 µs/cm. This will end the cleaning cycle.